An affordable multi-function printer ideal for small office users, the Epson AcuLaser MX14NF, steps up from its little brother the MX14 and includes the addition of fax capabilities along with copying and scanning, all for a an affordable price. 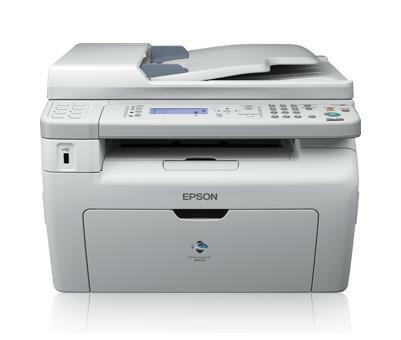 The Epson AcuLaser MX14NF takes on a fairly conventional persona, with a standard grey/white finish. It features a small mono screen at the front along with a host of navigational buttons. The printer is relatively compact (318 x 410 x 389 mm) and can house 160 sheets; it also comes with an additional 60 sheet multi-function tray. The MX14NF comes with some useful functions including an automated document feeder, and an Ethernet connection port at the back to add multiple users, or a work network. The Epson AcuLaser MX14NF is a great all-rounder and offers great functionality for businesses on a budget. It comes with a host of features you would expect to see on higher-end printers including an ADF for scanning documents in a hurry and a super-fast Ethernet connection for busy workgroups. Print speeds are average at 24ppm, but are consistent regardless of the number of print jobs. It's disappointing to see that the AcuLaser MX14NF has such poor paper capacity. With just a single 160 sheet A4 tray it's only a matter of time before it will have to be refilled, especially for offices with multiple devices. Print quality could also be improved, under stress-tests the MX14NF did suffer from slight signs of fading.